Please join us for a conversation that delineates strategies employed by South Asian feminists to occupy public space in South Asia as well as New York City. 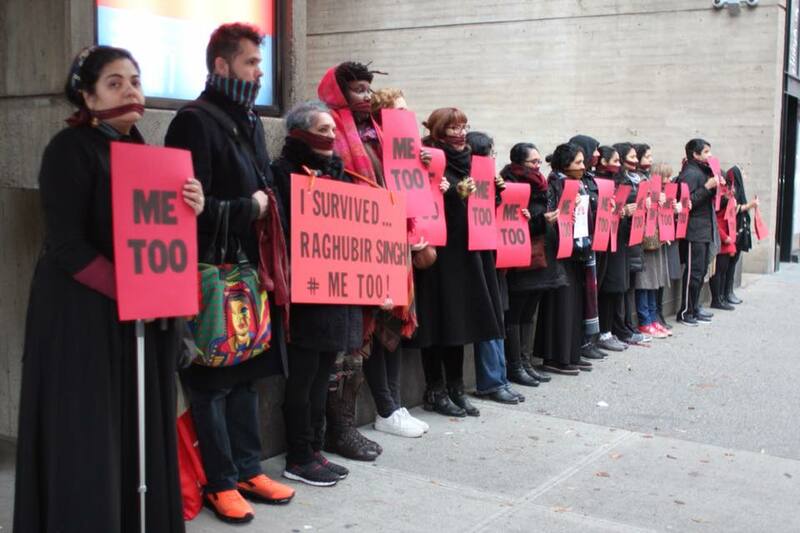 Shilpa Phadke, co-author of “Why Loiter?” and artist Jasmeen Patheja, founder of the collective Blank Noise will be joined by Jaishri Abichandani and artists, writers and activists who participated in her collaborative feminist participatory #MeToo at the Met Breuer performance protest on December 3, 2017, including Swati Khurana, Fariba Alam, Abeer Hoque, Ruby Chishti, Kavita Das, Saisha Greyson Noth, Mengia Hong Tschalar, Imani Uzuri, Rebecca Goyette, Christen Clifford, Kayhan Irani, Shelly Bahl, Carol Pariera, Ritty Lukose, Chaumtoli Huq, Sonali Skandan, Roohi Choudhry, Shahnaz Habib, Anuradha Bhagwati, Ambika Trasi, Sunita Vishwanath, Farhana Akhter, Nadia Nooreyezdan, Kamal Badhey, Shane Aslan Selzer, Sarah Khan and Tara Sabharwal. This event is imagined as a safe space for female identifying individuals, we respectfully request you honor this. This entry was posted in Events, Featured, Talks. Bookmark the permalink.